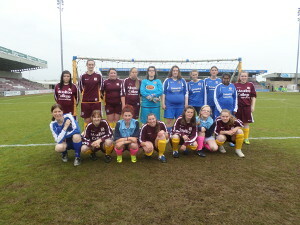 Leicester City Ladies and Asfordby Amateurs Ladies Inclusive Teams joined up for a football festival at the home of Northampton Town Football Club, as part of their Annual Disability Football Festival. The players had a great day of football and Leicestershire won Silver Medals in the competition with Northampton picking up the Gold. England & G.B. Cerebral Palsy Squad player Alistair Patrick-Heslton awarded the teams with their medals and was very impressed with the skills of All the players involved. 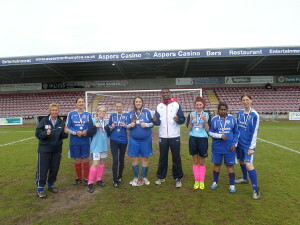 This entry was posted in Leicester City Woodgate FC Inclusive "Football for All", Girls & Ladies Teams. Bookmark the permalink.